The temperature of lightning is hotter than the surface of the Sun, averaging 20000 K, and ranging from 15000 – 60000 degrees Fahrenheit (8600 – 33000 K), whereas the surface of the Sun is averages 5800 K. The temperature range of lightning is measured using spectroscopy, but is this is mathematically demonstrable? Here we will calculate the temperature of lightning using basic electromagnetic theory and the Stefan-Boltzmann Law. Hopefully the presented model will be accurate enough to produce accurate results. 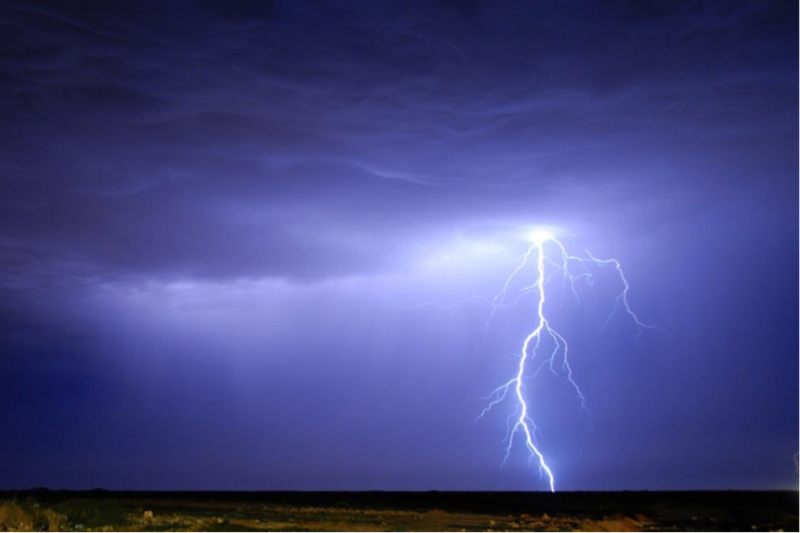 Treating the Earth and cloud as a capacitor, the current of lightning can be estimated. Treating the Earth and cloud as a parallel plate capacitor, the stored energy is equal to the product of its capacitance and voltage. The average current is defined as passing charge density divided change of time. Treating the flash of lightning as radiation from heat, the temperature of lightning can be estimated. Suppose the energy stored in an Earth-cloud capacitor is suddenly released. The energy is transferred between the Earth and cloud through the atmospheric medium, which if assumed to be the path of least work, would discharge minimum quantities of stored energy. This being said, the particles of a path traced from the Earth to the storm cloud would ionize the atmospheric gas particles, producing plasma that will radiate light, which can be measured by spectroscopic instruments. where is the surface area of the body of ionized air. The emissivity of the atmosphere is approximately one. I will assume the body of ionized air to be contained in a cylindrical volume. Interestingly, the temperature of lightning is independent on altitude. The main factor for storing all that energy is in the size of the cloud. Also, if the lightning spreads out over a larger cylindrical space, the temperature decreases. This figure is within the 8600K-33000K temperature range! Teaching mathematics with proper rigour is highly challenging in a large classroom setting. Schools and most institutions of education fail to achieve the imperatives of effective learning: maintaining student interest, good communication, cooperative learning, and most importantly, developing the sense of inquiry. The current teaching model for school mathematics is more like drilling maths into growing minds instead of growing up with maths in mind. It shouldn’t be that way; in fact, the latter road is much more rewarding –– it is efficient and enjoyable. Let the history of math introduce ideas and concepts. This elicits the feeling that mathematics is a culture, and vital to human civilization. It will also remind people of the impetus and purpose for investigating mathematical concepts. Use visuals as teaching tools. This method was widespread across many ancient civilizations, and it was extremely effective. People learn better with pictures and diagrams than words and equations. However, the equations must be introduced as a derived result to compactly express the maths. And that is all –– a useful, compact representation of the truth. Logical thinking and mathematical proof. There is nothing more vital to understanding mathematics than mathematical proof. Through reason and evidence, mathematical proofs secure its entire framework, making it both reliable and applicable. Learn how to apply maths to practical problem solving . Students should know that math is useful in making our world possible. So students should learn how to make mathematical models to solve actual real-life problems. Encourage students to discuss and create problems. When people discuss, learning will become more enjoyable, and the retention of knowledge more fruitful. When people create problems, more people will think and come up with solutions. This is how humanity makes progress. Do not give exams. Exams deter people from learning beyond the exam; instead, exams encourage people to study solution methods. Often times, when finding answers become more important than understanding the connections between subjects, knowledge will become secondary and eventually forgotten. Exams are a disaster for the retention of knowledge. The original purpose of curriculums is to make sure every student learns what is considered important. Without curriculums, teachers are then left to their devices, often teaching less than what is expected out of their students. Hence, a general curriculum is still required regardless of the style of teaching. I have devised a curriculum for each year into four modules: algebra, discrete math, geometry, and analysis. The idea is to introduce, on average, an equal amount of mathematical topics per module. I noticed that most modern curriculums waste too much time on solving algebraic equations, which (to great dismay) has been taught with limited relation to other forms of mathematics (i.e. geometry). As a result, geometry has been heavily de-emphasized, and much of discrete maths is pushed into university. Below are the allocated topics for grades 8-12. The number in parentheses next to each module is the order in which the modules should be taught. It is advised that math in grades 11 and 12 be optional, and be replaced for learning other skills related to practical problem solving and group learning. For students interested in pursuing higher mathematics and scientific careers, the combined grade 11 and 12 curriculum is nearly equivalent to first and second year undergraduate mathematics. But how can all this be done? Where do we find the expertise to train qualified teachers? Where can we find administrators who would be devoted enough to put forward such a standard? These pragmatic questions are valid, and they should be thoroughly addressed. However, to properly address such questions, this proposal should undergo much debate. Furthermore, we must always exploit the newest, most effective, and most creative teaching methods available. There is a vast reservoir of information called the Internet, and this reservoir has its medicines and poisons. The reason why we should advocate communicative and investigative learning is because this form of learning exploits the limits of the Internet. Many problems can be solved via Mining the Net, but progress itself cannot last entirely upon knowing what is instantly searchable. That is why, through students challenging one another with problems, we can outlearn what the Internet can immediately provide. This way people will search for background information and existing strategies for problem solving, but not how posed problems are exactly solved. Through communication, teams of students may pitch together what they know to arrive at a unique solution method. I also encourage math teachers to become learners as well. Get involved with the discussions students are making, and join them in their mathematical journeys.